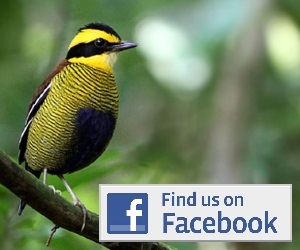 Long-tailed Starling, Biak Black Flycatcher; Biak Paradise-kingfisher; Biak Lory; Geelvink Pygmy-parrot; Biak Scops-owl; Biak Monarch; Biak Coucal; Biak Scrubfowl; Biak Gerygone; Biak White-eye; Numfor Paradise-kingfisher. Most birders just visit Biak, attracted by the easy access and large number of endemics that can be seen in a short space of time. Very few birders visit Numfor, largely as it is a lot more time consuming to get there for just one endemic as a reward (but it’s a good one!). All the endemics of Biak can be seen within a couple of hours drive of Biak town. The habitat in the vicinity of Biak town is a mix of cleared land and scrub and patches of degraded forest. Probably the best area to visit is to the east of Biak town near the village of Warafri. here a surfaced road cuts through forest and scrub and numerous footpaths branch off into more intact forest s short distance form the road. The birding is good along the road itself and along any of the footpaths. 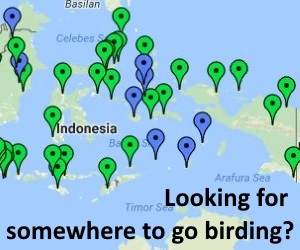 This area is pretty reliable for most of the endemics, including Biak Scops-owl, and is where Biak Monarch and Biak Scrubfowl is most regularly seen. Probably the only endemic it is not good for is Biak White-eye which seems to prefer more open scrubby areas. A second site to try is closer to Biak Town, accessed by taking a left turn off the road to Warafri (see map). This is another surfaced road that cuts through about 5km of mixed scrub and degraded forest. It is here that Biak White-eye is more common, and the site also holds Biak Coucal, Biak Gerygone and Biak Black Flycatcher. It is also a good place to visit in the evening when lots of parrots and pigeons are flying around. Biak Monarch has also been seen here once. If you’ve got longer to explore on Biak it may also be worth heading further east from Warafri where there is more quite intact looking forest and some strange flooded forest areas and lots of mangrove. You could also try driving to the north of the island where more extensive tracts of intact forest still remain and where Victoria Crowned-Pigeon can still occasionally be seen. Many of the airlines flying between Jakarta and Papua stop over at Biak (Garuda, Merpati) so it is a convenient place to visit on either the way in or out. It is also pretty easy logistically, and most, if not all, species can be seen within 2-3 days. For these reason it also make a nice starting point for a trip to Papua as you can get into the swing of things before visiting sites that are logistically more challenging! It is also a good place to make your obligatory visit to the local police station to arrange a ‘Surat Jalan’ for other places (for more information on Surat Jalan visit here). To get around you need a car. You could simply hire a taxi from Biak Town or there are a couple of local guys that know the birding sites, including Pak Rustan (+62-852-444-93000) a local minibus driver that knows the sites but not the birds, and Benny Lesobar info@discoverpapua.com that knows a bit of both. The are lots of hotel options in Biak Town. Many people stay at the Arumbai Hotel in town (www.arumbaihotel.com) as it is convenient. Numfor is a harder spot to get to. There are occasional flights from Biak, but their availability and schedule changes frequently. Best bet would be to check at the airline offices at Biak airport to find out what options exist when you arrive. Numfor is also served by overnight ferries from Biak 2-3 times a week, but again the schedule changes frequently and the only way to get reliable information would be to visit the ferry port in Biak Town and check. Biak and Numfor can be visited year round but expect rain showers at any time. I had the pleasure to spend a week on Biak and Numfor Islands. Biak is a really easy destination to get to with Garuda and other main airlines operate daily flights here! Right at the Airport you will have a choice of the rather basic Marasi Hotel or the excellent and more upscale Asana Hotel so no real need to stay in the city! The greatest asset was Saenal a local taxi driver with good english and experience in driving birders around! He will know the sites for the birds but not the birds! His number: +62 8 525 445 5251. Birding in Biak is not very exciting as it’s mainly roadside and the habitat is exclusively secondary forest but the birds are great with the Paradise-kingfisher and the Monarch are must on any serious birdwatchers bucket list! Numfor can be more difficult even if on paper it should be straightforward! Susi Airline operates a round trip starting in the early morning from Manokwari to Numfor to Biak and back to Numfor and arriving back to Manokwari by noon! They operate this on tuesdays, thursdays and saturdays. The only thing is they often just cancell flights as it happened to me making things rather difficult and more expensive. If you’re lucky and the flights go they are really scenic with magnificent views of the islands and the reef. The ferry runs sporadically when I was there Monday and Tuesday was only possible to Manokwari. The greatest asset on Numfor was Budi a young policeman with reasonable English and a strong motorcycle who was very happy to drive me around the island. On the day of my cancelled flight we just drove around the whole island (80+kms) and he didn’t even want to accept money! His number +6281248151015. Even if you’re more than one person give him an sms and he can help you with transport …. very few cars on the island. Numfor was a lot more fun birding than Biak with fewer people and better habitat with a great Pacific island vibe and smiley people!!! The Paradise-kingfisher is an absolute must happily common. The difficult bird here is the Barred Cuckoo-shrike the best chance for this was the cross island track running from Namber village! The Pitta and Scrubfowl was easier here then on Biak. The biggest let down on Numfor is the accomodation! The only losmen on the Main Street close to the Airport is below basic which is a shame as you could really spend a holiday on this great little island. Maybe the Cristian Seminary’s rooms opposite the losmen are better but I didn’t try this.